A power inverter or inverter plays a role in converting the DC power from batteries to AC power for charging most appliances. According the output wave forms, it can be mainly divided into modified sine wave inverters and pure sine wave inverters. The modified sine wave inverter outputs waveform that has a time interval from the maximum value in the positive direction to the negative value in the negative direction. That means, the waveform is still composed of broken lines, thus without good continuity. However, the pure sine wave inverter can output stable true sine wave power as good as the one from the grid we use every day, without electromagnetic pollution. It works higher efficiently, suitable for all kinds of loads. The pure sine wave inverter can be applied for common appliances and devices without interference, like cellphone, laptop, TV, etc. 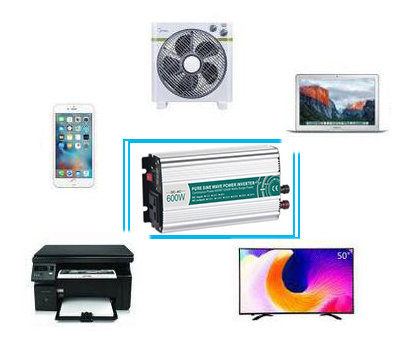 ATO provides you high efficiency pure sine wave inverter with continuous output power ranging from 300 watts to 6000 watts.The inverters are available for input DC voltages 12V/24V/48V, and output AC voltages 110 V/120 V/220 V/230 V/240V. The prices for pure sine wave inverters are listed in the table below for your reference. More details and latest prices please move to the product page of pure sine wave power inverters. How to Choose a Right Power Inverter for Car?